"THE MOST AMAZING SCHOOL TRIP FOR INTERNATIONAL SCHOOLS"
Students develop leadership skills in a unique and safe Swiss mountain setting with exciting challenges and great outdoor activities aligned with the curriculum and staff of the school. The Swiss Leadership Camp is specifically designed for school groups and is no everyday summer or winter course. We are known for the absolute pinnacle of leadership development and our senior trainers have the privilege to work with students from the best and most recognised schools around the world. This is one of our flagship programmes, an award winning, fun-filled and must-attend camp. We provide students with the opportunity to develop leadership and communication skills, goal setting, time management techniques, to learn about savoir vivre and etiquette, communication skills and to collaborate more effectively in teams while working on exciting challenges and great outdoor activities in a unique mountain setting with experienced trainers, professional mountain guides and coaches. Staff and teachers from the school are also present throughout the entire camp in case students have any questions and to effectively follow up on the camp back at school. At the end of the multi day camp students return to school with their personal action plans, certificates, new friends, better bonding and new leadership skills that they can use during school, sports and their daily lives. Be the best you can beFresh air, mountains, lakes. Altitude + attitude = 100% fun. The programme and specially designed endeavours combine outdoor activities and fun games with training and evaluations and have proven to be a powerful means for developing leadership skills. In conclusion to the Swiss Leadership Camp, students are encouraged to identify personal goals and make a commitment to accomplish these during their academics, sports and daily lives. We promise an experience that will not only challenge students, but an experience that will be so much more fun than one can imagine possible. This is an exclusive opportunity for each and everyone committed to connect, contribute and grow on an immense scale. We ensure that every student gets excited by the range of activities that are specially designed for our Swiss Leadership Camp. Activities suit all fitness, age and experience levels while our profesional team is there to help and to make the Swiss Student Leadership Camp a great experience! Each day students have the opportunity to take part in fun and Challenging activities that help everyone to enjoy and step out of their comfort zone. We developed unique activities in the glistening mountains, lakes and forests that surround our campus. Students wake up in a comfortable dorm room with one to three others, before enjoying breakfast prepared by our talented chef and his team. Most of the rooms have ensuite bathrooms and all the boys and girls have seperate dorms. 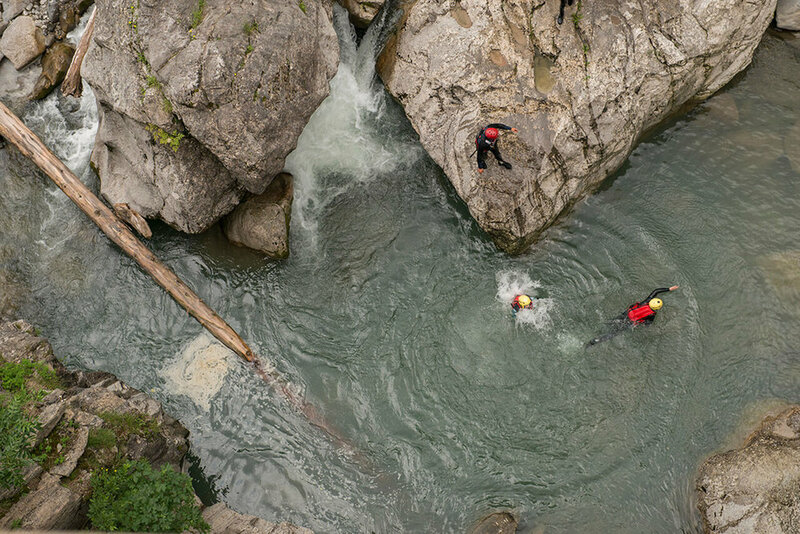 Students receive expert instructions from professional mountain guides on exciting activities like canyoning, boat building, mountain hikes, watersports, and rock climbing and can also practice some more traditional sports like beach volleyball or build a camp fire at the lake. There are great activities that suit everyone. After dinner, we evaluate the day and the knowledge that was acquired from the trainers and do some extra fun challenges. Students can set new goals, work on personal action plans and particpate with wonderful games at the campus. Our evenings are fun-filled with an exciting mountain challenge and end with activities like music making and roasting marshmallows at a campfire at the mountain lake or enjoying Karaoke and unique Games and Sports Challenges at the camp. Swiss chalet & full boardingWell organised, more fun. Our two neighbouring charming Swiss style wooden chalets are set in an unspoilt mountain village situated between Lake Geneva and the famous resort of Gstaad. The numerous beautiful landscapes of the valley with mountains and lakes offer great activities during the winter and summer. Our beautiful and traditional chalets provide the comfort and unparalleled luxury of today for groups of 30 to 140 students. The chalets are specifically designed for our leadership camp and girls and boys have separated rooms. You can rest assure that everything possible is done to see that everyone is well looked after. Together, we create a very warm, welcoming and enriching learning environment. Beautiful mountain campus with rooms up to 2 or 4 beds and ensuite bathrooms. Spacious dining room and a large terrace overlooking the valley. Full boarding. Our chef and kitchen staff only use fresh products from the valley and all menus are well balanced. Healthy, varied food, adapted for all diets and eating habits is prepared including vegetarian and religious diets. Our staff looks after the specific needs of the students who are in their care 24 hours a day, and also include a night guard and nurse who is constantly present. A professional training team of senior experts who work with your students around the clock. During outdoor activities we work with the best and certified local mountain guides who know the area for over 20 years. We serve your students a wonderful breakfast, lunch and dinner and some surprise snacks throughout the day. Healthy, varied food, adapted for all diets and eating habits is prepared including individual preferences like vegetarian and religious diets. Our chef and kitchen staff only use fresh products from the valley and all menus are well balanced and tailored to your students needs. We pride ourselves working with the best international schools around the world. Each training and leadership camp is followed by an evaluation and possible training at the school. Experience shows that students are able to specifically describe in their personal action plans the things they learnt and how to develop specific competences. The Student Leadership Camp provides students with the opportunity to develop leadership and communication skills, goal setting, time management techniques and to collaborate more effectively in teams. All skills and learning outcomes are aligned with the curriculum of the school while skills can be used in academics, sports and in students’ daily lives. Ultimately, students learn to take responsibility for their own learning in preparation for life at school, sports and beyond. Advisors can follow up and the Personal Learning Plans give a good starting point for the guidance programme. Results show that the majority of students gain from the training and apply the tools, competences and strategies in their studies and lives. Use effective strategies for learning and study including personal learning styles and study skills while taking responsibility now and in the future. Enhance communication skills in the areas of public speaking, presentations, media training, effective conflict management and university applications and interviews. Manage time and resources effectively by setting short and long term goals, make constructive choices and learn everyday by effective self evaluation. Develop personal talents, use specific teamroles in a team, motivate members of the team and create synergy while achieving results. Professional team International mindset& Swiss accuracy combined. Senior trainers with an incomparable track record work with your students around the clock and have widespread experience working with youngsters from all cultures around the world. Depending on group size we bring in 3 to 6 trainers to train students on leadership skills while each trainer looks after a group of about 15 students. On top of this, we work with certified and professional mountain guides who guide all outdoor activities. Depending on the activity the guide to student ratio is 1:6 or 1:12. Including all trainers, staff from the school, camp and activity managers, mountain guides and boarding staff, the ratio falls to 1:5. Trainers are also present during the outdoor activities to facilitate development of leadership skills amongst students and oversee the learning outcomes of the training programme. Our Camp and Activity Manager supervises camp operations, coordinates all activities, manages safety, boarding and activities throughout the camp. Our camp and activity managers speak English, French and German and have extensive experience managing all sorts of events ranging from 10 to 3.500 guests at various locations in the world. Our staff looks after the specific needs of the students who are in their care 24 hours a day. The majority of trainers and all mountain guides have a first aid and CPR qualification. Our camp and activity managers speak English, German and French. At least one of our senior trainers speaks French. All mountain guides speak English and French. We are committed to the finest standards possible in facilitating a unique learning experience and ensuring the health, safety and wellbeing of your students. Rest assured that all of our staff is focused on the safety and security of your students. Your students are given all the support needed to ensure they are safe, enjoy their time and perform at the best of their abilities. That being said, in case of illness or accident, we are only minutes away from world class professional assistance. We have an up-to-date medical clinic in Leysin, and we have access to a regional hospital and university hospital only respectively 40 minutes and 75 minutes away, or only 10 minutes by helicopter. We have all expertise to manage the Student Leadership Camp with great care, enthusiasm, attention for detail, operational excellence and safety. We integrated the same risk assessments procedures at the Student Leadership Camps as we use for the various large events we run and manage together with city councils. Our trainers carry mobile phones at all times that allows them to react quickly in case of emergency. Sports and activities are practiced only with certified guides who speak English and the majority also French and have experience working with large groups of youngsters from different cultures. Depending on the activity we use a guide to student ratio of 1:20, 1:12 or 1:6. Furthermore, the trainers also join most of the groups to observe and feedback on leadership skills and responsibility. We only work in suitable conditions and we are well informed of any weather condition changes. When needed, we modify the programme of the day according to the weather conditions. The camp is managed by our Camp and Activity Manager who are responsible for the entire camp and coordinate and supervise the senior trainers, our boarding staff and guides. Each group of about 20 students is supervised by a senior trainer who manages the leadership modules and accompanies and takes care of the children during activities and throughout the camp. Finally, there is a team of kitchen staff, cleaners, nurse, and others, who all watch over the wellbeing of your students during the Leadership Camp. Students have a premium coverage for accidents during their stay at our camp. The insurance is valid between the time of arrival at our camp and the time of departure from our camp. Our team will manage the entire camp. However, staff from your school is around to help students if they have any questions and to effectively follow up on the camp and learning outcomes back at school. For any questions or additional information please fill out this form and one of our consultants will get in touch with you directly. Send us an Email or call our head office.